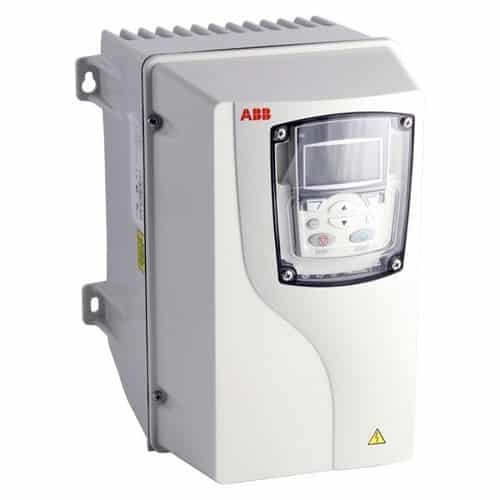 Variable frequency drives and Soft starters are widely used in industrial motor control and pump control. Both of them are semi-conductor devices. VFD and soft starters although working on similar principle are different from each other. 1. 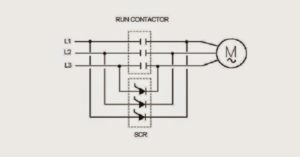 Why are VFDs and soft starters used for controlling/starting of motors? 5. Selection – Where to use soft starters and where to use Variable frequency Drive? 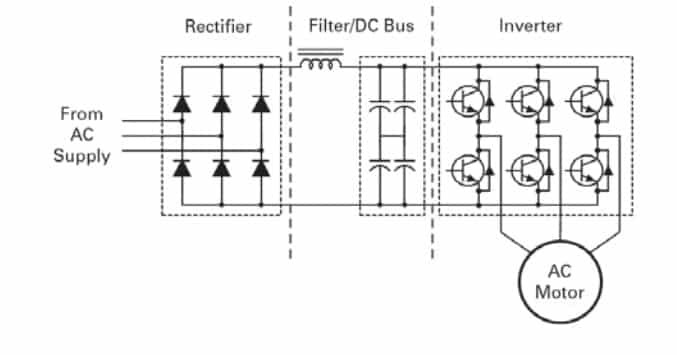 Why are VFDs and soft starters used for controlling/starting of motors? 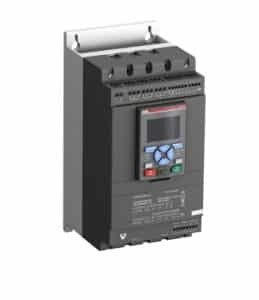 Variable frequency drives are semiconductor devices mainly used for motor torque-speed control and protection. It can start and stop a motor smoothly. Speed torque characteristics of a motor can be controlled throughout its operation based on the application by using a VFD. Speed of the motor can be controlled from 0 to its rated speed (sometimes above the rated speed) by varying the frequency of the motor supply. 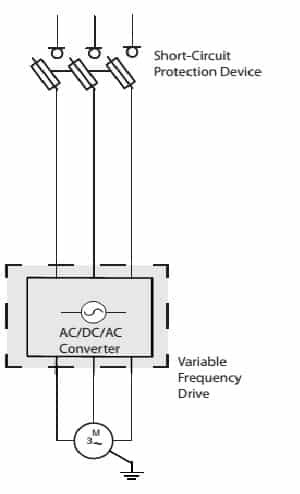 V FDs control motor by varying the frequency and voltage the input supply. We all know that the speed of a motor is directly proportion to its supply voltage. 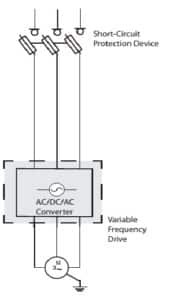 In a VFD first the input supply is converted into DC and then it is again inverted back to AC of desired voltage. Speed of the motor is varied from zero to full speed by smoothly varying the supply frequency from 0Hz to rated motor frequency. VFDs can offer smooth start, smooth stop and complete control over motor speed and torque. Power savings is the principal advantage of any VFD. Complete control over motor speed can be achieved using VFDs. VFDs can be programmed to vary the speed of the motor it controls, based on factors such as flow, pressure etc. Third quadrant operation is possible by using a VFD. Dynamic torque control and perfect speed control. Best suited for elevators, escalators, crushers, mixers etc where speed needs to be maintained in spite of load variations. 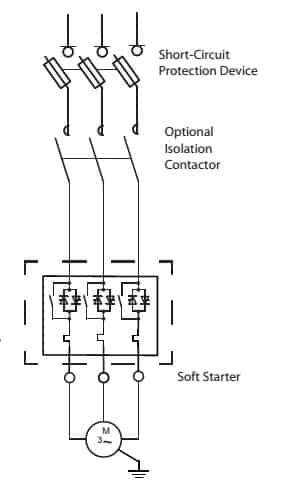 Soft starters are als o semiconductor devices used to start or stop a motor. As the name indicates it offers a smooth start and smooth stop. 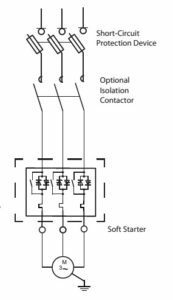 Usually, soft starters are bypassed by a contactor-overload circuit as the motor gradually reaches its full-speed and gets back into action when the motor stops. Soft start and stop are achieved by temporarily lowering the motor terminal voltage. 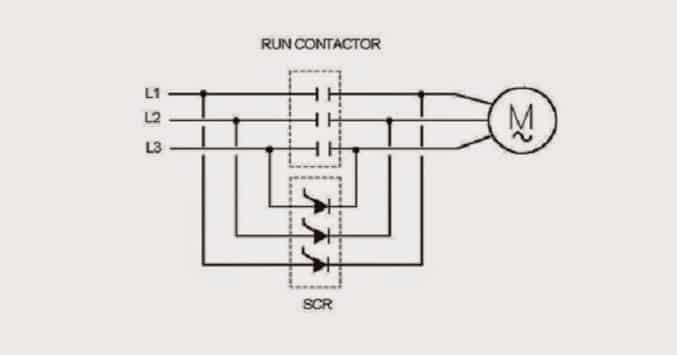 A soft starter consists of three pairs of back to back connected semiconductor devices such as thyristors for regulating the terminal voltage. These thyristors are switched alternatively to reduce the terminal voltage and inrush current. The terminal voltage of the motors can be controlled by varying the firing angles of the thyristors. Effectively reduces inrush current during motor start. Low cost compared to Variable Frequency Drives. Best suited for conveyors, pumps and other belt-driven applications. No harmonics Harmonics are injected to the mains. Hence additional filters should be used. 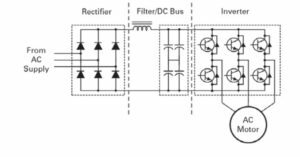 Selection – Where to use soft starters and where to use Variable frequency Drive? In applications where, speed control is not essential. In low and medium torque applications. Reduce wear and tear during start and stop. In applications where initial cost is low. VFDs are used in applications where complete control over speed is essential. Where initial cost and size is not a problem. Variable frequency drives and Soft starters are energy efficient devices. Selection of one over the other depends on the application, control, cost and space factors.